Deal Maker, or Deal Breaker? When you pulled that direct mail pitch from a charity out of your mailbox this morning, what made you open it or dump it? I bet the teaser on the envelope made the difference, for reading or tossing. Mal Warwick in his book, How to Write Successful Fundraising Letters, gives us a ton of quick tips, ranging from compelling teasers to a list of strong leads for your letters, to ways to start a P.S. To create an effective teaser for your envelope, Warwick tells fundraisers to think about the "need" or "function" you want the teaser to fulfill before you write it. Example: "Your response needed within ten days." Function: Flag the importance of the contents. Example: "She was only 11 years old. She was as old as the hills." Example: "Your Free Gift Card Enclosed." Example: "Would you spend $1 a day to save the life of a child?" Example: "What do these people have in common?" Example: "Take this simple quiz to learn your Health I.Q." Warwick says none of these teasers guarantee that your reader will open your appeal. And, indeed, there is a lot of argument about teasers. What we do know is that, in the words of one fundraiser, "lame" teasers don't work. In fact, no teaser is better than a bad one. Warwick even says that terrible teasers can make a direct mail envelope look more like junk mail than something from a friend. Would you go to jail to keep a puppy from being tortured? WE ARE! P.S. We named the duck Harold. Will you be killed by a handgun in the next 23 minutes? (Back flap): Someone will be. What functions does each of those teasers serve? Of course, teasers only work within the context of the entire direct mail package...the envelope, the typeface, the colors, even the postage. The best teasers and envelope designs flow right on through the entire package. A teaser is not only words but design and images. 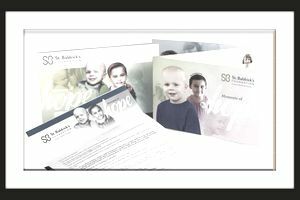 Seeing those elements repeated in your letter, brochure, donation form creates a holistically pleasing experience for the recipient. A good example is at the top of this article - the St. Baldrick's campaign mailing. How will you know if your teaser works? Only by testing. So think carefully and test more. To write great teasers, collect a lot of examples and not just charity direct mail packages. Commercial examples (and you have a ton right in your mailbox) often have the best teasers of all. Keep a swipe file (mine is just a big box) of everything that comes in and then sort it out every few weeks Save the inspirational packages, dump the rest. You're bound to find many envelope teasers to spark your imagination. Another great source is the websites of direct mail vendors. They often have pages of sample campaigns they have created. Although many nonprofits create their own direct mail campaigns, it might pay to hire a professional. There are many companies that have experience with charitable appeals and some that specialize in them, such as TrueSense Marketing and Blackbaud. Don't lavish days on writing your letter, and then just dash off the teaser. It deserves your most creative effort. And remember, a bad teaser is worse than none.